And this transport volume is showing no signs of slowing down. As the global economies further entwine, we are increasingly dependent on the movement of goods via trucks. By 2040, the US Department of Transportation predicts that freight volume in the United States will grow by 29 billion tons. This is an astounding 45 percent increase that will cause congestion on our highways, intensify local air pollution and contribute to greenhouse gas (GHG) emissions. Most heavy-duty vehicles are powered by diesel engines that emit high levels of particulates, nitrogen oxides, and other pollutants. Based on their mileage and fuel consumption, freight vehicles are among the highest contributors to GHG emissions and street level pollution. Freight vehicles also spend much of their lifespan operating in highly urbanized corridors, which are the most impacted by pollution. Further exacerbating this problem: a 2015 US Department of Transportation study found that the “last mile” of freight movement—transporting the product from a freight hub to its final destination—is the most inefficient. The resulting delays and congestion only intensify air pollution. In fact, heavy duty vehicles represent just two percent of vehicles on our roads, but are responsible for 23 percent of all on-road greenhouse gas emissions. The trucking industry is a major oil consumer. The industry in the US, the EU, and China combined consumes 17 million barrels of oil per day. That’s one-fifth of global oil demand, according to the International Energy Agency. With the consumption of consumer goods continuing to increase, both regulatory agencies and transportation companies are under pressure to reduce this footprint. Governments have set aggressive GHG reduction targets, and due to the high volume of freight transport vehicles on the road, moving to zero-emissions in freight transport will go a long way to meeting these targets. In the US, heavy-duty vehicles such as combination tractors/trailers, vocational vehicles, heavy-duty pickup trucks and vans must achieve up to 27% C02 emission reductions over 2017 baselines by 2027. That is a meaningful decrease in emissions. 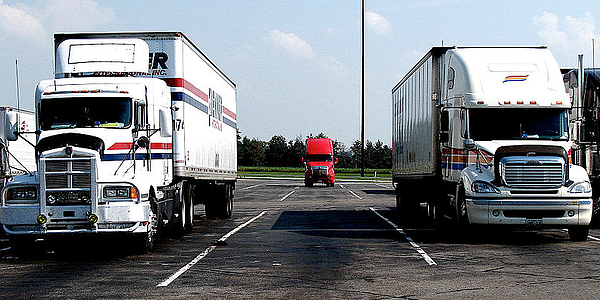 Achieving Zero Emission Vehicle Mandates for Freight: Can Electric Batteries Work? In many instances the immediate response to zero-emission vehicles (ZEV) mandates is to adopt a battery electric solution. But this doesn’t work ideally for all for heavy-duty truck applications. As the range and duty cycle increases, so do the battery requirements. As the battery becomes larger to power the vehicle, its size increase also reduces the available payload for transporting goods, creating a “Catch-22” situation. The more payload that needs to be hauled, the larger the battery becomes, reducing the vehicle’s overall hauling capability. While batteries are a consideration for achieving freight GHG emission reduction standards, there are other zero-emission transport technology options. In a fuel cell drayage truck, the diesel engine and conventional drivetrain is replaced with a battery-hydrogen fuel cell hybrid system. This hybrid architecture maximizes the benefits and performance of electric trucks in heavy duty applications. Hydrogen fuel cell vehicles are a zero-emission electric vehicle since they emit only water vapor from the tailpipe. And, they’re 100% zero-emission on a well-to-wheels basis when the hydrogen is produced from renewable energy. Hydrogen offers much higher specific energy than batteries. The lighter weight contributes to solving the range and payload issues inherent with a 100% battery-powered propulsion. Hydrogen is the on-board energy source that powers the electric drivetrain, significantly extending the vehicle’s range capabilities when compared to a straight battery solution. Plus refueling times are virtually the same as with diesel. Recharging time is a handicap of a battery-only solution. Recharging takes time - more time than simply refueling the vehicle and it requires the heavy-duty vehicle to be pulled out of service. And we all know that if the vehicle isn’t on the road, it’s delaying delivery of the product, while not generating revenue for the fleet operator. Innovators at three major automotive and distribution companies are making the switch to hydrogen fuel cells. Kenworth’s hybrid battery-fuel cell Class 8 drayage truck is completing testing that started in 2017. The truck is powered by Ballard's FCveloCity® HD module, and will be used to haul loads at Southern California ports. Kenworth’s initial reports state that the truck has enough power to compete with the diesel trucks that currently dominate port traffic. 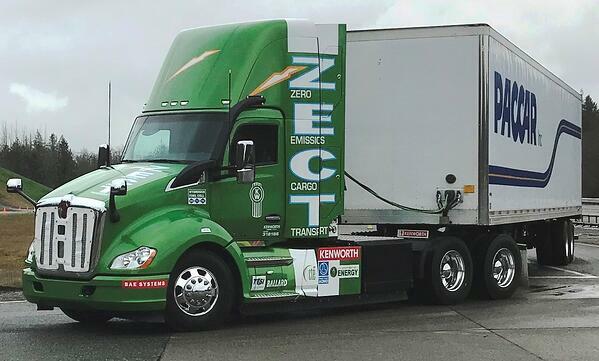 Drivers appreciate the quietness of the fuel cell-electric powertrain, and note that the truck’s performance is on par with other conventionally-fueled Kenworth drayage trucks. Additionally, in May 2017, UPS unveiled its first prototype for an extended range Fuel Cell Electric Vehicle (FCEV) which will be powered by Ballard FCveloCity®-MD30 module. Toyota has also released a prototype of a Class 8 Drayage Truck. While these trucks are still in the demonstration phase, fuel cell electric buses have been commercially deployed to great success for years. For example, in London, England, Ballard-powered fuel cell buses have exceeded 28,000 hours of operation without need to replace their fuel cell stacks. And according to the Medium and Heavy Duty Fuel Cell Electric Truck Action Plan for California, lessons learned from implementing and operating fuel cell bus programs should be transferred to truck applications. These best practices can help reduce investor risk and accelerate project performance. The need for zero-emission heavy-duty transport solutions has never been greater. For the sake of our planet and our future, private industry and policymakers must come together to continue to push fuel cell electric truck projects into the commercialization stage. Fuel cell technology is the only zero-emission solution that enables freight transportation without payload compromise.